A unique chance to experience beautiful walks, divine food, delicious wine, art, music, sacred sites & natural mineral spas in stunning locations. The perfect balance between exploration and indulgence will allow you to reconnect with your wisest and highest self. Arrival at Genoa . The accommodation is a boutique hotel 4*, located in a noble palace of the XIV C in the very heart of the historical centre. Genoa – Genoa “The Superb” city- imposing, grandiose, but also haughty and proud is a city of strange contrasts. The birthplace of Christopher Columbus and Paganini, Italy’s biggest port, Genoa is squeezed between the mountains and the sea. 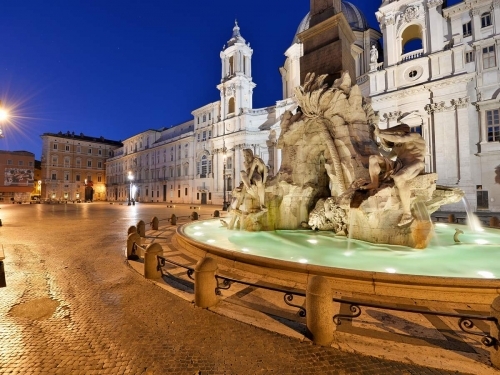 Here you will discover Renaissance palaces, grand 19th-century boulevards and gilded Baroque churches hidden alongside the narrow medieval alleys called “caruggi” by the local people. 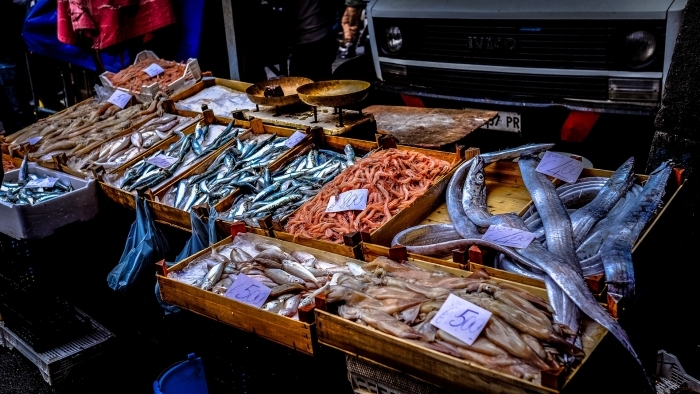 Genoa is made for exploring and getting lost in the medieval quarter with its lively food shops, bars and trattorias …and it is all part of the experience. Day 2: Walking in the historical centre: breath the history of Genoa! After breakfast, meet our guide and start the visit of the historical centre, one of the oldest and well-preserved in Europe. Along the narrow alleys, you will discover hidden noble palaces, churches, food shops, local markets in a colourful mix of cultures. 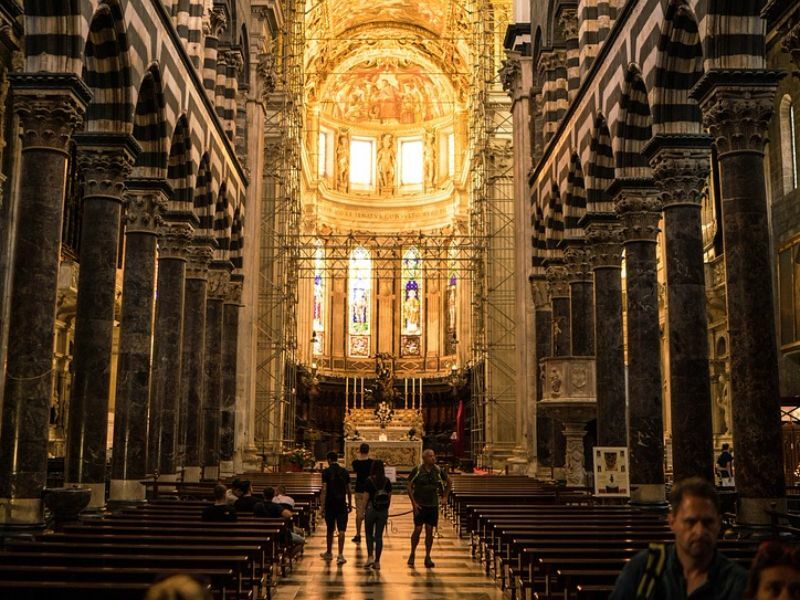 You will admire the stripy marble façade of San Lorenzo Cathedral, dating to the 12th century. You will see a very small and beautiful piazza – San Matteo- home to the powerful Doria family for 500 years. See the 12th-century church of San Matteo, with its beautiful 14th-century cloister and breath the history that permeates this place! Lunch in one of the oldest “osteria” of the historical centre, where local people usually go to eat the very best and genuine Ligurian dishes: focaccia, farinata, anchovies and the famous “pansotti” (a sort of vegetable ravioli) together with a glass of local white wine “il bianchetto”. Rest of the time at disposal to discover the city by your own. Dinner at leisure and overnight. In the morning departure for a trekking excursion on the Promontory of Portofino. Meet your buddy guide and proceed with an easy walk through maritime pines, chestnuts trees and oaks. You can stop in the rural house “Agririfugio Molini” for a coffee and then continue your walk to San Fruttuoso bay. Here time seems to stop… crystaline waters, an ancient abbey, fishermen boats. 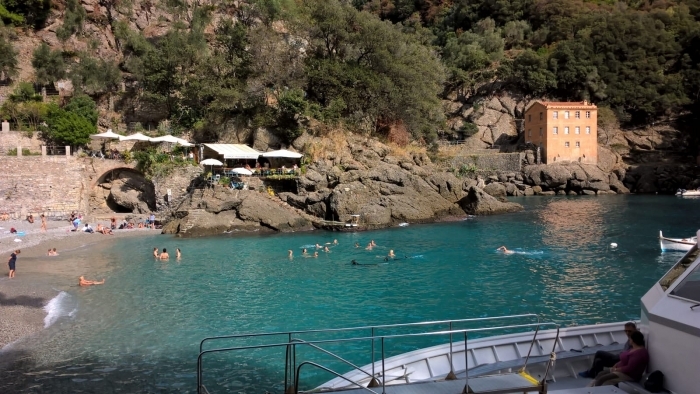 The right place for a refreshing bath before going back to Camogli by boat. Lunch in local restaurant where you will taste the home-made Lasagne with pesto sauce and the catch of the day. 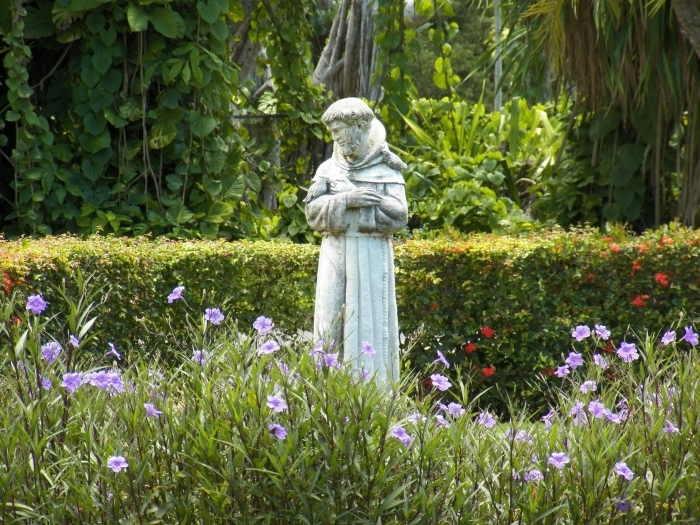 You will have free time to visit the abbey by your own. Back by boat to Camogli. San Fruttuoso – one of the most unique and special places in all of Liguria It is tucked away in a tiny, pristine bay between Camogli and Portofino surrounded by lush vegetation . 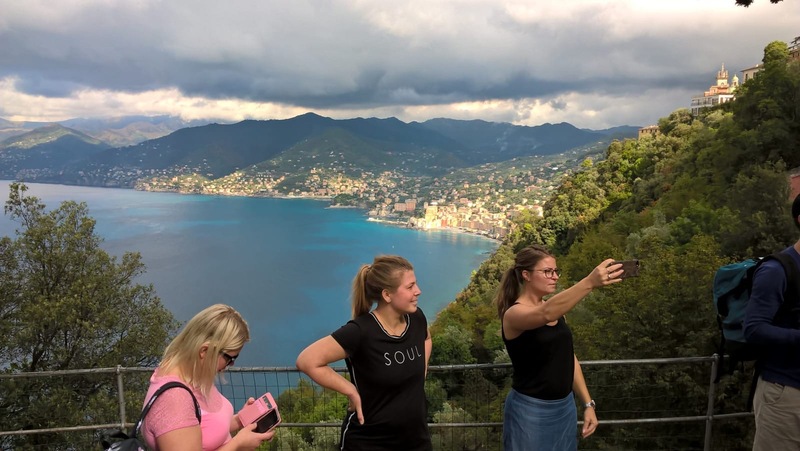 To add to its exclusiveness, you can only reach it by sea or on foot, hiking the near nature trails of the National park of Portofino. One is its charming Abbey which has an interesting and rich history from being a monastery to a pirate’s den to a humble fishermen home and then the residence of Princess of Doria. Christ of the Abyss (Cristo degli Abissi) statue, submerged in the waters of the Protected Marine Area of Portofino, has become one of the most famous and popular diving sites in the world. The statue was placed in the waters of San Fruttuoso di Camogli on 22nd Aug 1954 at a depth of about 18 meters by the Costa family. From Camogli, transfer by minivan to Levanto. Arrival and accommodation at family run hotel 3* Villa Martgerita. Dinner at leisure and overnight. H 11.00 Transfer to the historical centre for a hands-on experience: a Pesto course! You will learn how to prepare this typical Ligurian sauce – made of aromatic basil leaves, olive oil and cheese – in the traditional way…with marble mortar! Since 1976 in Levanto’s historical center the laboratory of the pesto prepares the most ancient and well-known sauce in the world. In this laboratory you will have the chance to learn how to make the pesto sauce with your own hands following the tradition. After tasting a glass of sparkling wine accompanied with a local extra virgin olive oil on a bruschetta, you will taste the pesto sauce made with the modern method while assisting the demonstration and explanation of the pesto sauce made with the mortar. Here comes the moment to make your own pesto sauce with the mortar: wash and dry the basil leaves, pounding them together with salt, pine nuts and garlic, add the parmesan cheese and at the end the extra virgin olive oil. You will get a concentrated and perfumed pesto cream, which can be used on the pasta or on a slice of bruschetta. At the end you will enjoy your own made pesto sauce together with a glass of white wine and some typical local products such as olives “taggiasche” (small and black olives), bruschetta with anchovies and a typical pastry with limoncino. 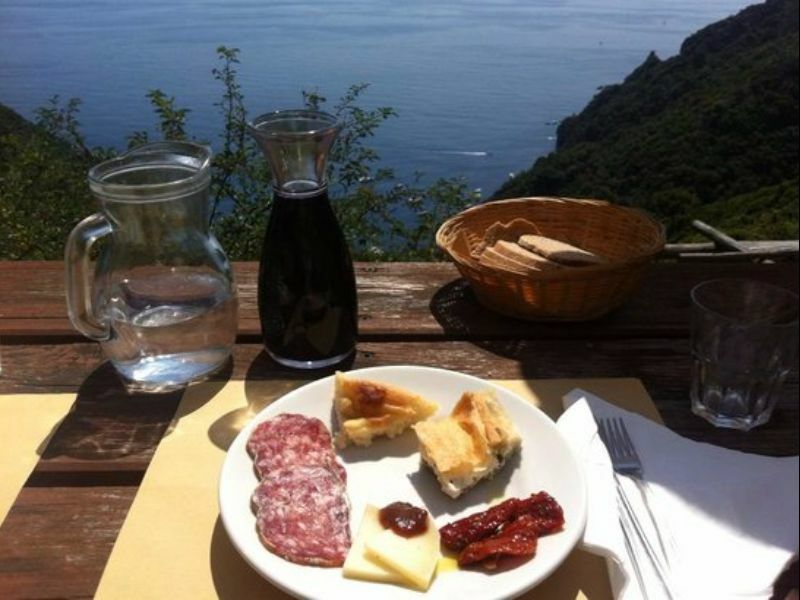 Free time at disposal in Levanto for a relax walking on the seaside and a light lunch. 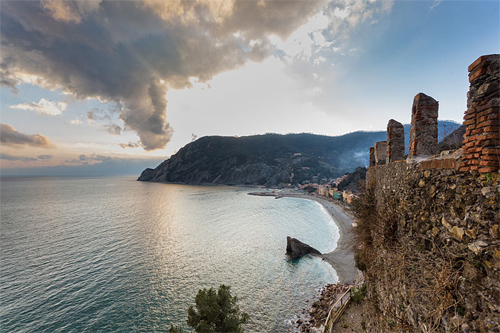 Levanto is settled in a gulf that has inspired poets, innervated by a valley trails, a paradise for walkers and backdrops so valuable to be protected as a Marine Reserve. The Cinque Terre few kilometers away, architectures of stories to tell, menus for sea food lovers and vegetation of olive groves and vineyards. 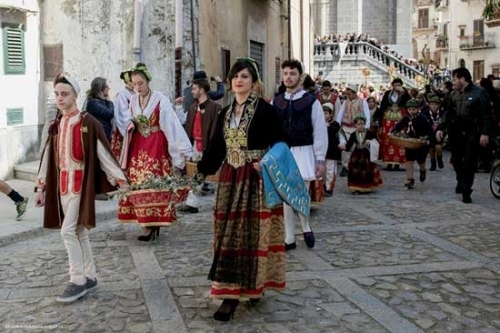 Here the “philosophy of the fine living” animates local people and the high quality of life made Levanto enter into the prestigious SlowCity association, which promotes “slow” tourism, characterized by the rediscovery of traditions, culture and flavours. Breakfast at the hotel. In the morning train ride to Levanto a short visit of the town. 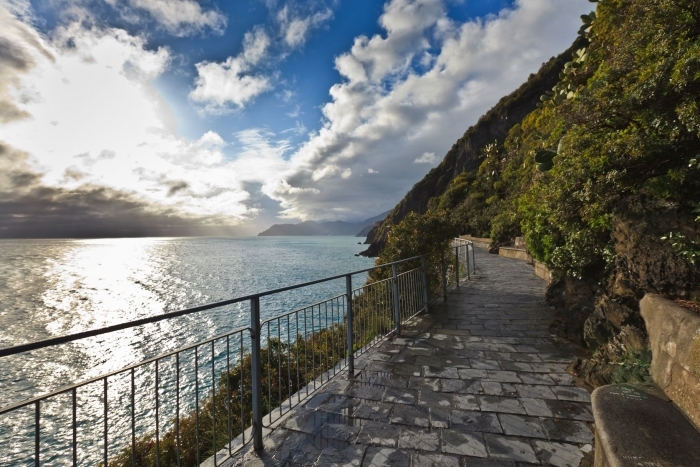 Then you hike on a beautiful and varied path up to the Mesco promontory which divides the bay of Levanto from Monterosso, the first village of the Cinque Terre. 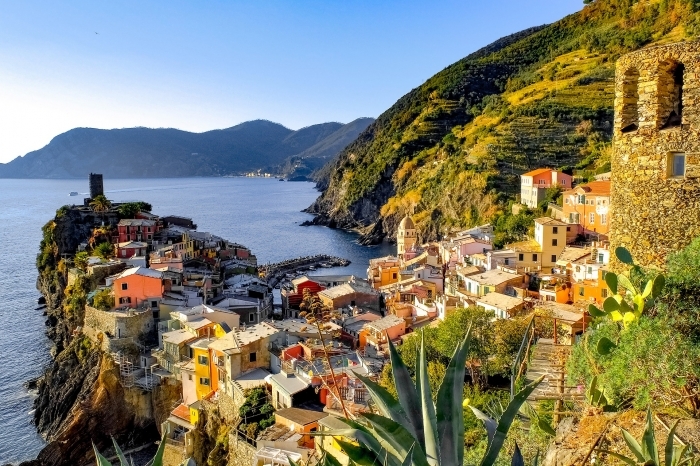 The hilltop, called Punta Mesco, offers an amazing view over the whole Cinque Terre coastline. 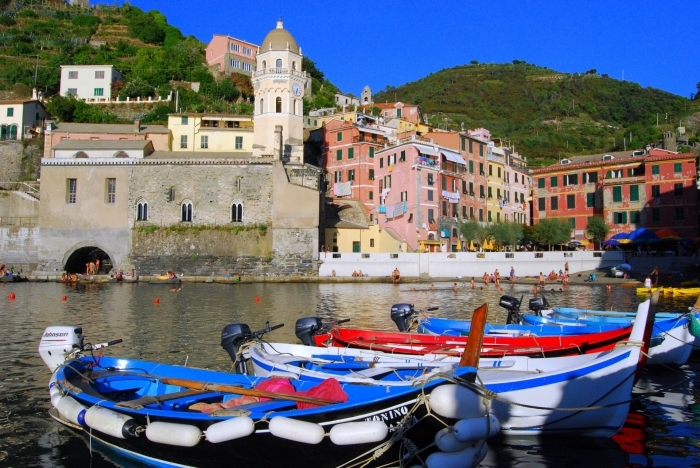 The tour ends in Monterosso with a promenade along the beach and some spare time for a visit of the old town centre. At your arrival in Monterosso we would like to offer you a winetasting of wines from winemakers only from Monterosso. You will taste a conventionally made Cinque Terre DOC white wine, a naturally and traditionally made local white wine and a Sciacchetrà. Through this tasting we want to show you how in a limited area like the Cinque Terre completely different wines and philosophies of winemaking can develop. You will learn more about the new generation of Cinque Terre wine makers and the renaissance of traditional wine making. The tasting will be accompanied by some little crostini and some cantucci with the Sciacchetrà. Free time at disposal in Monterosso. Return to Levanto by minivan. Dinner at leisure and overnight at the hotel. After breakfast, check out and transfer to Galleno. 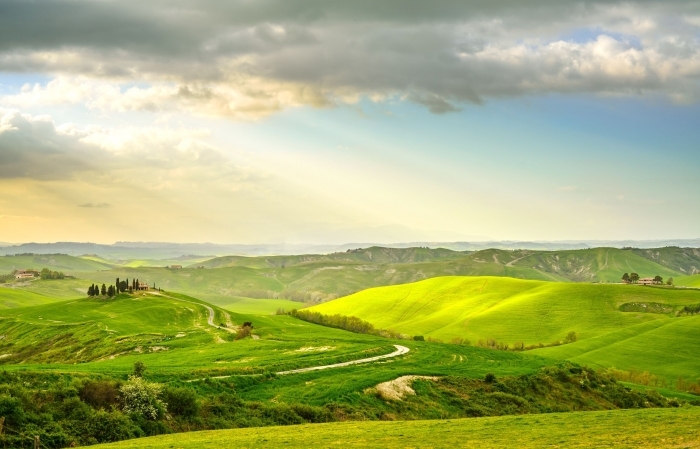 Start walking on the Francigena way – the ancient Pilgrimage path from Canterbury to Rome. 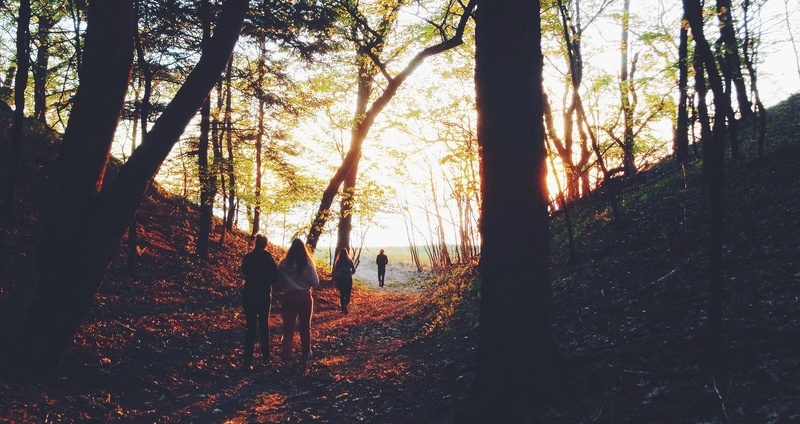 This Camino is a spectacular and epic heritage trail dating back to the Middle Ages. In the initial section of the route cross a lovely paved track along the ancient Via Francigena. Past the area of Cerbaie, wild and deserted. Head for Ponte a Cappiano, where there is a hostel quarried from an ancient Medicean bridge. Then we cross an old swamp that has been recently improved and go uphill, in the direction of the interesting city centre of Fucecchio . Here you will have time for lunch and then you will meet your driver for proceeding to San Miniato. Arrival in San Miniato and accommodation in Hotel Miravalle. Dinner at Leisure and overnight. 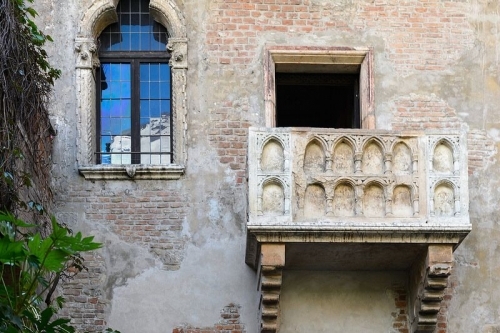 Hotel Miravalle – Enjoy the intact atmosphere of Italian middle ages. This hotel is set right under the Tower of Frederick in the ancient square of the castle, facing the Duomo Cathedral.Delight on Italian and regional dishes in the restaurant with panoramic dining room, from which you can admire the wonderful Tuscan hills. 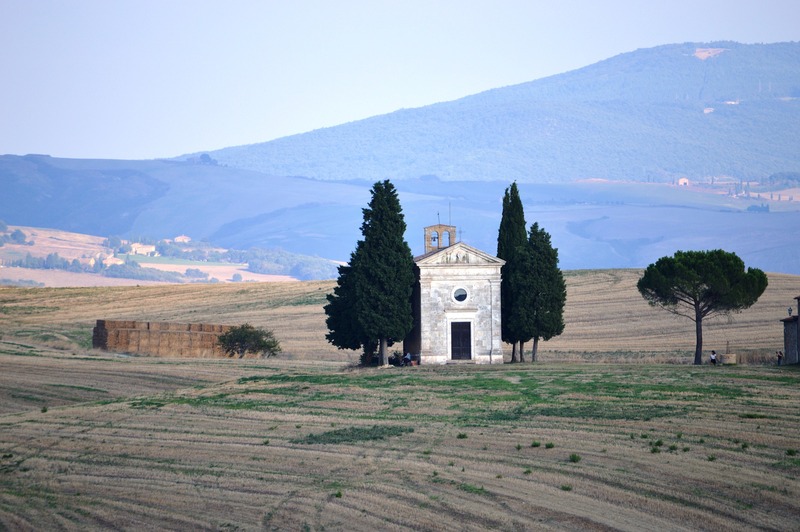 San Miniato – a land of Etruscan and Roman settlements…narrating over 2000 years of history. Here everything has an order, everything has its time, everything has a reason, everything has a harmony.It seems to travel in a sort of time machine, which refers to different eras and centuries.You can not run, you need to stop.To think. There are places that give you peace of mind and inspire an inner search as the convent of San Francesco, built where the patron saint of Italy stopped. Look at the top along the streets and read the tombstones of many famous men who have made the life and history of the city.Napoleone Buonaparte was one of these. Breakfast. 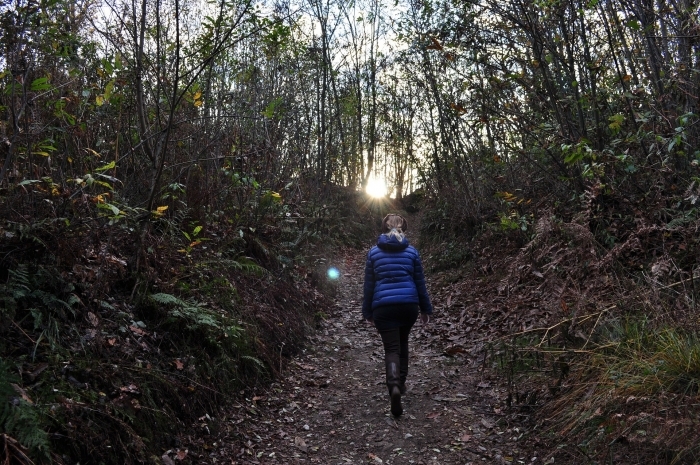 Today you will meet Massimo and his dog for an exciting truffle hunting in the woods around San Miniato. At the end enjoy a special tasting of real truffle. Truffle hunting is an ancient tradition in Tuscany and requires only one rule: respect for nature; for this reason it will be necessary a small briefing before going into the woods, a “sacred” place for the truffle hunters. During the truffle hunting I tell you about the truffle, the magic of its traditions, its history, the legends which recall its myth, its uses in the kitchen and you will learn how to recognize and distinguish a good truffle from other “fake” truffles of inferior quality and artificial products. Todat you have a treat…a lunch based on authentic white truffle! Return to San Miniato and enjoy free time at disposal. Breakfast, reach Castelfiorentino with the minivan and then from the quarter “Case Nuove” start the walking path to Gambassi Terme – an extraordinary track among hill crests in Val d’Elsa. For a fitting end to the day you can enjoy a healthy bath in the hot springs of Gambassi, surrounded by a park of ancient trees. The Parco Benestare offers visitors the chance to approach the spa waters in an original new way. On one side, immersed in the lush greenery of the municipal park, is the spa building of Gambassi Terme, which is particularly valid in medical and scientific terms. The environmental setting in which this structure stands is extraordinary thanks to the ideal climatic conditions and its historical, artistic and natural Heritage . The other side of the park is rich in fountains, springs and outcrops which are open to visitors and lie within a landscape which enhances their benefits. The waters which flow into this stream have all circulated underground for an extended period of time (over 50 years). Enjoy the therapeutic and emotional benefits and to get to know the facilities offered by the spa of the park. An original new way to enjoy spa water, which becomes the leitmotiv of an adventure which allows visitors to experience the senses of the area. Pick up and transfer to San Gimignano. Accommodation in hotel. Breakfast. Departure to San Gimignano. On this interesting route, you can visit the Sanctuary in Pancole, before walking up the characteristic populated area in Collemucioli and the enchanting Pieve of Cellole. Arrival in San Gimignano. Time to relax, dinner at leisure and overnight. Breakfast. Departure to Colle Val d’Elsa. 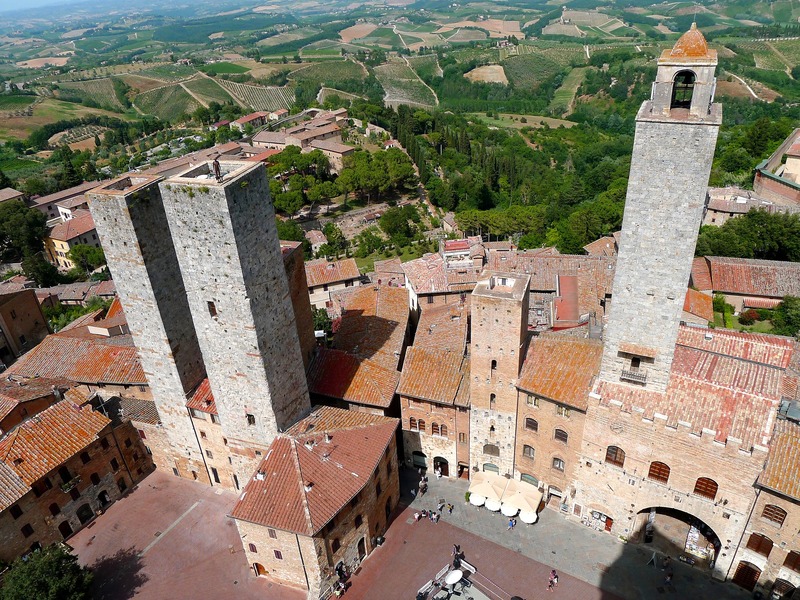 From San Gimignano you will continue, up and down, through the Tuscan hills. At one point of the journey, not yet identified, you will come to Molino d’Aiano, one of the halting places along the ancient route of Sigerico. 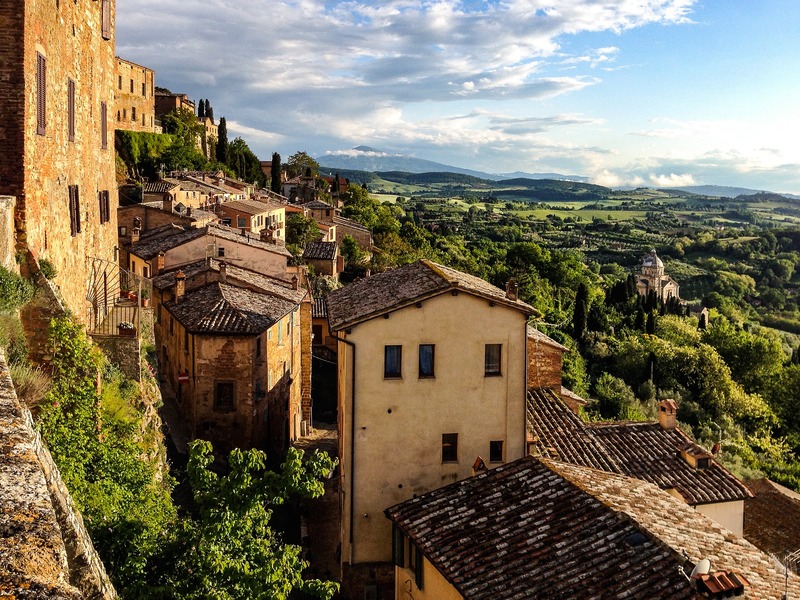 Today’s destination is Colle Val d’Elsa, a Tuscan village which will take you back in time, with its charming old town centre and narrow alleyways winding through the stone walls. Lunch in typical trattoria, overlooking the beautiful panorama on Tuscan hills. 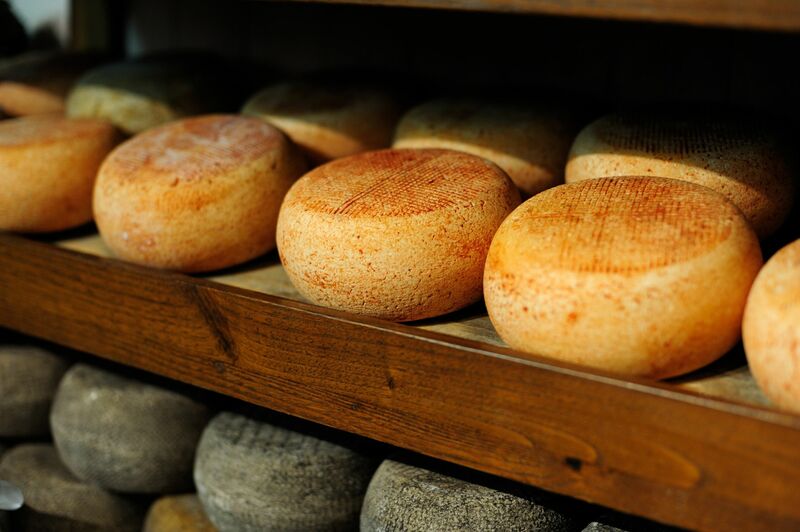 Here you will taste some local cuts and cheeses and the veal meat with aromatic herbs from the garden. 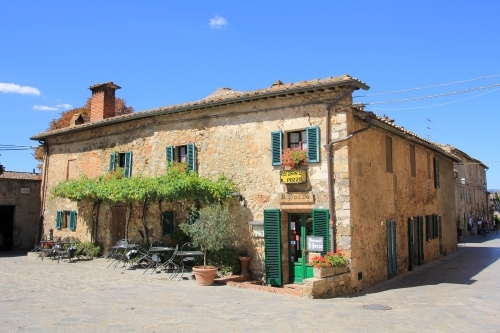 Arrival and accommodation at Relais Castelbigozzi. Dinner at leisure and overnight. CastelBigozzi, one of the oldest and embattled castles of this area, rises in the land of Strove. In the Middle Ages this castle belonged to the ancestors of the ancient noble Montanini Family. A place of antique charm, immersed in the stillness of the Tuscan countryside, where you will feel enveloped by the warmth of the hospitable environment and by the richness of a land that speaks the language of Art, History, Nature and Traditions. An ideal place to find peace. Breakfast, today you will walk among a beautiful and peaceful scenery. Prepare yourselves for one of the most beautiful sections of the Via Francigena: a meditative route, along which you can admire the Pieve di Strove (unfortunately just from the outside) and stand in the quietness of the splendid Abbadia a Isola, where time seems to have stopped 1000 years ago, when Archbishop Sigerico stopped there. Your breath will be taken away when you see the castle of Monteriggioni, with its crown of towers, built on a hill with the aim of defending the ancient Republic of Siena from Florence. Within it, a small ancient world, with the beautiful square and small gardens where you will be able to gather your breath, before climbing up onto the walls to admire the surrounding view. After breakfast, departure toward Siena. From Monteriggioni you will start your walk again along the white roads of the Senese countryside, passing through the old, no longer inhabited medieval village of Cerbaia arriving at Pian del Lago. Here you will meet your driver to get to Siena. 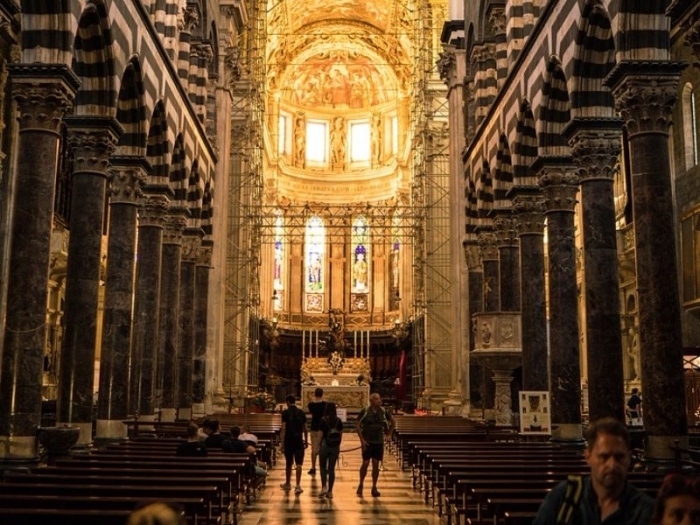 Experience the same feelings as the ancient pilgrims passing through porta Camollia, the traditional Francigena entrance to the town of Siena. An unforgettable way to celebrate? A plate of Pici all’Aglione in the illuminated Piazza del Campo. And don’t forget the panforte! Enjoy some free time in Siena, to explore the beautiful historical centre. Here you can have a typical lunch before proceeding to Orcia valley. Arrival and accommodation in Relais Il Chiostro di Pienza – an ancient convey. In the evening enjoy a typical dinner in the hotel’s restaurant or in Bagno Vignoni. Breakfast. Transfer to Terme San Filippo. For nature lovers the Fosso Bianco is the perfect place, a stream in the woods at the confluence of several hot springs in a series of pools where where you can swim all the year long and enjoy the special limestone formations that for their shapes have inspired the evocative such names as ‘the white whale’ or ‘the glacier’. The area is reachable by a road above the village. The first pools and the first limestone formations are quite close while to see the famous waterfall and swim in the white sulphurous waters must go further. Through a picturesque walking path in the green of the bush to get to the pools, accompanied by the sound of water. Acqua Passante is a small water source downstream of the village known for its rich mineral and chemical composition. Some residents and tourists using the health resort drinking this water during meals. It is reached via a short walkway near the park Citerni. Return to Pienza. On the way back we suggest a stop to Bagno Vignoni with its thermal pool, just in the middle of the main square and the small and intimate S.Quirico d’Orcia. Here you can taste a glass of local red wine “Montepulciano” in the Enoteca Al Pozzo. Breakfast. Departure to Spello (1,5h). From Spello start the path to Assisi on San Francesco’s footsteps. Mount Subasio from Assisi to Spello for the CAI (Italian Alpine Club) trails. 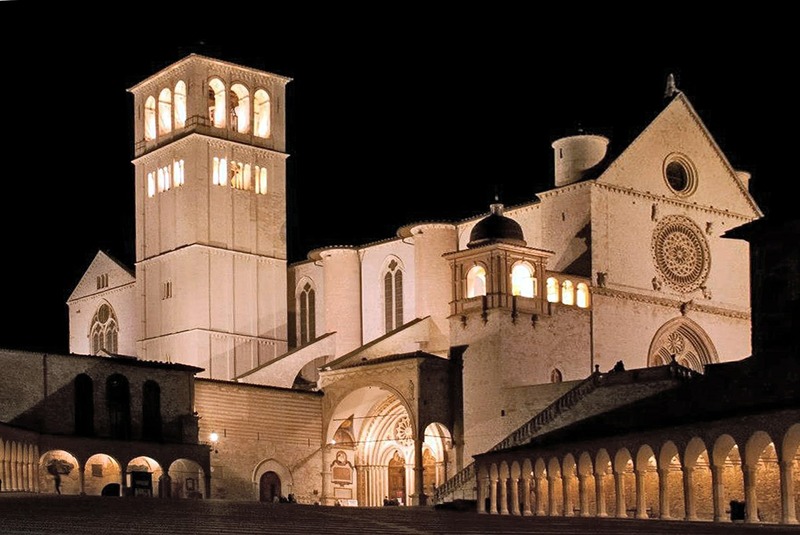 The journey is long but not difficult and concentrates within it the best that Umbria has to offer: the historical and architectural wonders of two of the most beautiful medieval towns in the region, the Franciscan spirituality of the hermitages, the pristine nature, the landscape, and the traditions. To complete the path, it is necessary a full day of walking (6-7 hours). You will reach Eremo delle Carceri, the Franciscan village-monastery which, through forests of oak and natural caves, it’s one of the loveliest spots of Assisi. Here you will meet your driver to get to the hotel. Dinner in the restaurant of the hotel and overnight. 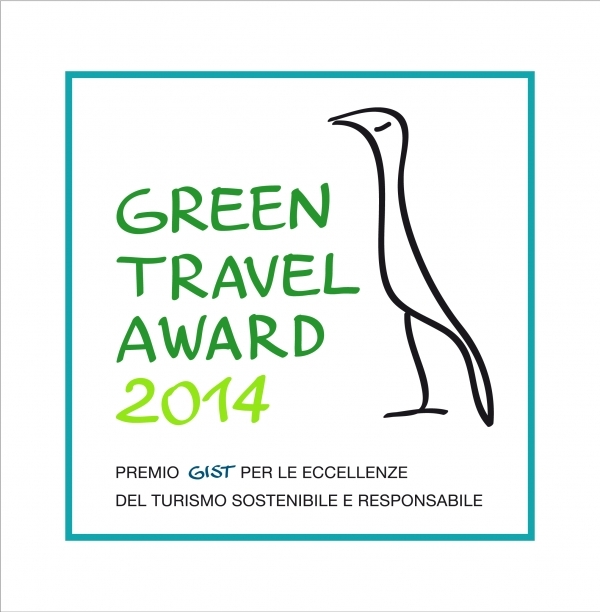 Castello Petrata – far from the confusion, this hotel is shrouded by the Umbrian hills’ silence, colours and scents. This peaceful oasis is a 4 stars hotel located within a 20 acres park where courtesy and affability marry both culture and art. The Hotel arises from an ancient XIV century fortress, along its annexed chapel, back into its old splendour due to some conscentious restoration. The restaurant serves as a refined, small-scale universe where guests may relish on traditional dishes from local cuisine. Breakfast. 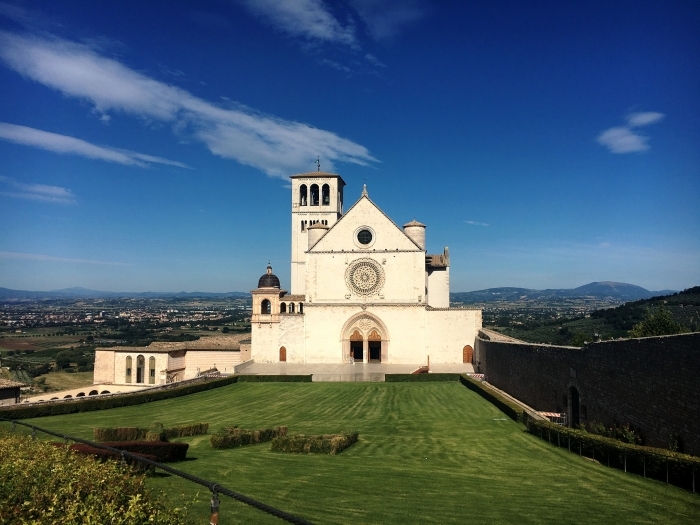 Time at leisure in Assisi. Dinner at leisure and overnight. Breakfast, check out and departure. 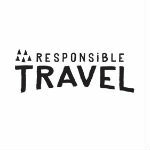 Her 35 year career in travel and tourism has spanned a broad spectrum of roles. Working her way up from simple beginnings in Perth, then doing stints in Sydney and Europe led her on many a daring adventure. 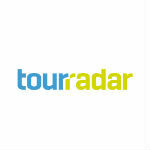 Returning to Perth in the late 80’s, she continued her career in tourism industry. Quietly happening in the background, Julie’s personal interests have always included a commitment to health and wellbeing of mind, body and spirit. Passionately involved in yoga, meditation & spirituality for many decades, her personal journey has guided her on a quest for a more balanced and meaningful life. 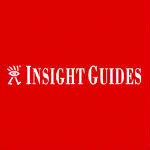 Years ago, a series of simultaneous life changing experiences had her delve more deeply into her spiritual practices. Compelled to follow her inner guidance, she was attracted to certain locations of the world, gaining insights into how she could navigate through this very challenging time. The heightened energy at these places allowed her to explore her situation within a very nurturing & supportive environment. She discovered the ancient indigenous wisdoms of this earth to be very healing, allowing her over time, to regain her healthy, joyous vitality. 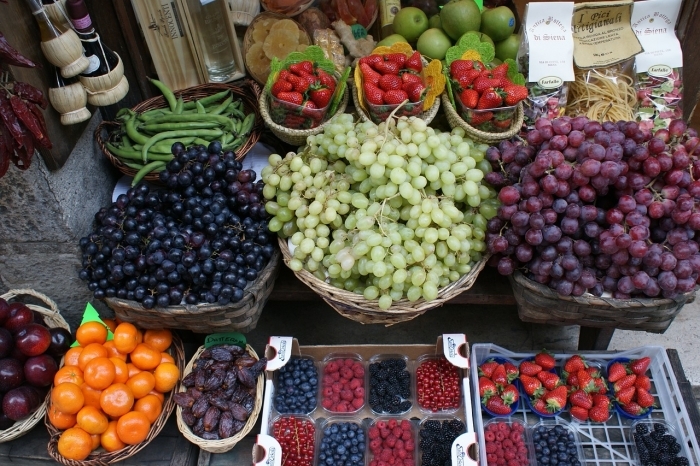 Join Julie on a journey to experience & enjoy ‘la vera Italia’ ~ the real Italy. Having lived in Italy, Julie will share her favourite secret treasures of these Northern regions that you may never have known existed. The travel experiences created together witrh FindYourItaly are true Journeys of the Spirit – combining unique & inspiring locations with the desire to have deeper, more personal journeys easy accessible and enjoyed in authentic, comfortable sorroundings. The vision in the creation of these very personal and special experiences is that they may touch your heart, support and empower you in a deep and long lasting way. Why are Italians so passionate about life? We will discover why and how they bring connection, balance & joy into their daily life. Truly inspirational!